Spam Musubi is probably one of the most popular grab-n-go snack-appetizer-meals in Hawaii and it is truly unique to Hawaii. 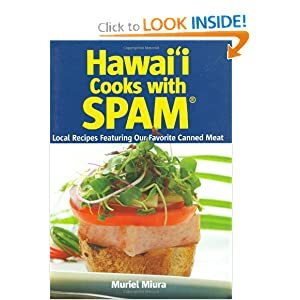 I know that there really isn't a "recipe" for spam musubi, but there are a lot of people who don't really know how to make it. Take for example my nephew... I get a call one day and he asks "how do you make spam musubi"? I was shocked and embarrassed to say the least. So in this "recipe" I will outline the basic ingredients and technique that will catapult you to spam musubi rock star status. Measure 4 cups of uncooked rice rinse and cook preferably in a rice cooker following the manufacturers instructions. Generally, 4 cups of uncooked rice and about 4 1/4 cups of water works for me. Put your spam musubi mold in water, then put a layer of rice (about half way up the mold), press down with other mold half, then add spam, egg, teriyaki sauce if you want, then more rice on top. Press again with mold press. Remove from mold and wrap with nori. You might want to wet the edges of the nori to ensure that it sticks. Different sauces, fillings, nori type ie. seasoned nori, deep frying with tempura batter on the outside. Get crazy and enjoy! !